This is a guest post written by Jodi Okun (@JodiOkun), College Advisor and host of the #CollegeCash Twitter Chat. I am excited to be this week’s special guest. As Jodi and I talked about a topic that would be of interest to parents, college students, and educators preparing students for the college; we wanted to explore how we could work to help students entering school knowing they matter. We hope you join us for the conversation. Mattering a universal human need, and it’s one you have the opportunity to satisfy. So how do you let your child know that he/she matters? Angela will answer this question with the 12 most important ways to let someone know they matter. It’s not just about what you say; it’s also about the way you listen and the questions to ask. You’ve got to be present and encourage and reassure confidence in your child. But before we can convince anyone else that we matter, we must first convince ourselves. This is not a desperate attempt to justify our existence nor glorify our importance. Knowing we matter is key to our existence – as important to our survival as air, food, and water. To aid you in this process, Angela will also share her “YOU MATTER Manifesto”, designed to empower you and help you realize the importance of contributing to the world by living your genius. Work on that talent and know you are responsible to put to use the gifts that have been entrusted to you. Life and work is hard enough and it is easy to get into situations that tear us down. People want and need to be inspired. When people are inspired, they are lifted above these kinds of circumstances and allowed to see the upside of what they can achieve or become. If you can be the one who inspires them, by encouragement or modeling, you’ve helped them and you matter! Mattering is a process not an event. Take your dreams and your talents seriously and inspire your child to do the same. Topics: The college cash chat covers the financial aid process and has guest hosts who cover specific topics. Emojis: I get it. They are silly little things; so easy to mock until you use them and understand their true power. Think for a minute about life B.E. (Before Emoji’s) Have you ever written an email or text that was perceived the wrong way due to lack of human emotion? Or maybe you have received a text and had trouble trying to decipher exactly what the sender was trying to get across? The way we write something and the way another will read it based on their assumptions oftentimes makes the message we are trying to get across very different from what we mean. THIS is one of the many reasons #EmojisMatter. Emojis and Emoji Literacy (thank you Dominoes) have become a staple of our language, culture and identity. They have the power to express tone, sentiment, and emotions that can not be communicated as powerfully or accurately with words alone. When we write or speak to someone in person we use tone, body language, and facial expressions to convey our message. Emojis give our virtual communication this meaning, tone, and emotion. They allow us to add a secondary layer to our messages, one that helps the receiver understand what we are trying to get across. Emoji matter because they give us the ability to transform the way we communication virtually. 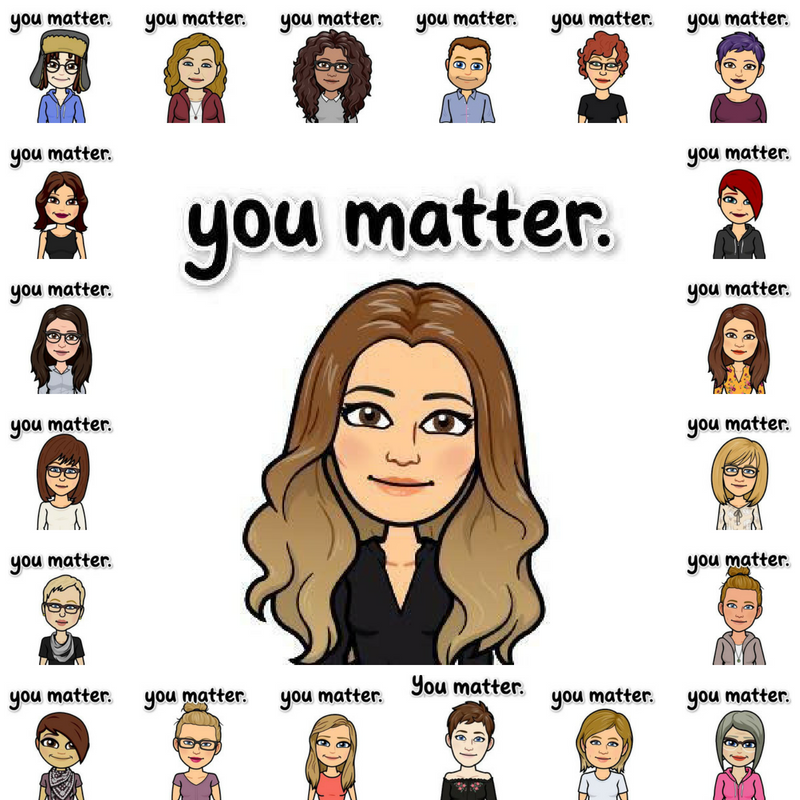 This is why I am so thankful for my friends at BitEmoji for their “YOUMATTER” emoji; where we can remind ourselves and others that we do matter; that we are powerful beyond measure and are needed by the world. Seeing thousands of you exercising your voice, your presence and power (Remember Literacy is not reading and writing; it is about power and privilege) in this way has been one of the most inspiring things I have seen in a very long time. I can't think of a better message to rally others around; can you?